Mood board: Last summer, Eudon Choi travelled to St Ives in Cornwall, and was not only enamoured by the raw beauty of the coastal town, but also its rich artistic legacy. 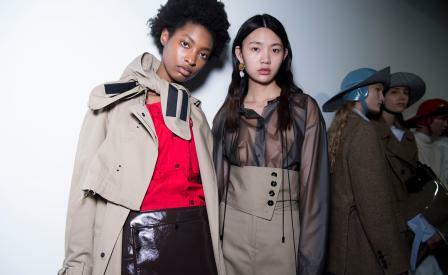 ‘It’s such an interesting place with such an interesting history,’ said the Korean-born, London-based designer after his show. Choi was particularly fascinated by creative pioneers Christopher Wood, Ben Nicholson and Alfred Wallis, who were at the epicentre of the modernist movement in Cornwall during the 1920s. His A/W 2018 collection explored the relationship these artists had with their environment, touching on elements such as the famous Cornish light (still much admired today) and the rugged tools and textures of the fishing trade. Best in show: Choi originally trained as a menswear designer in Seoul, and his exemplary tailoring skills were apparent in the sleek suiting that featured throughout the show. In fact, the deconstructed shirts and vibrant wide-leg trouser-suits were among the strongest looks in the collection. Elsewhere, a collaboration with famed milliner Noel Stewart led to the creation of glossy sou’westers, which gave fisherman knit jumpers, drawstring trousers and soft trench coats a playful, off-beat feel.